and is for entertainment purposes only. Regarding the disappearance of the five Navy Avenger planes on December 5, 1945 I hold the leading theory. It states the sun and later the moon disoriented the pilots, thereby causing all their deaths. First the low to the horizon late afternoon sun sold the illusion it was setting South, which is impossible because the sun always sets West. Then around 6pm a 29-hour old moon made its first appearance just prior to setting West. They thought it was rising East and according to the JAG transcript they turned around 180 degrees beyond the point of no return and flew out to sea to their graves. From 3:15pm to 6:15pm was the worst three hour period for navigation in three years... 1 - 25,000 rare anomally of the sun and moon! The pilots first got disorientated around 3:40PM when they began heading West back to Ft. Lauderdale after a practice bombing mission over the Bahamas. It was a triangular mission East to the Chicken and Hen Shoals and North to the Great Sale Cay and then back to Ft. Lauderdale. On the final leg back to Ft. Lauderdale the sun had a S/SW compass heading, as it is furthest South for the year in December. I am sure this is what happened to the five missing Avenger planes and the Official JAG transcript bears it out. After flying in circles for an hour and a-half on their final leg back to Ft. Lauderdale and at 5:10 the lead pilot stated they were heading West which they did for 56 minutes. And when they were beyond the point of no return they turned around 180 degrees at 6:06PM and flew East out to sea to their deaths. 5:10PM Captain Taylor… We are now heading West. 6:04PM Captain Taylor... Holding West course. Should be able to see a light. (the moon). 6:06PM This is Taylor... Turn around and fly East until we run out of gas. At 6PM the moon was 29 hours old and it would set West at 6:29PM. To test my theory go to Ft. Lauderdale, Florida in December and check the position of the sun at 3:30PM. It will appear low to the horizon S/SW. The tower kept telling them to follow the setting sun and head West. The tower was wrong. 1. 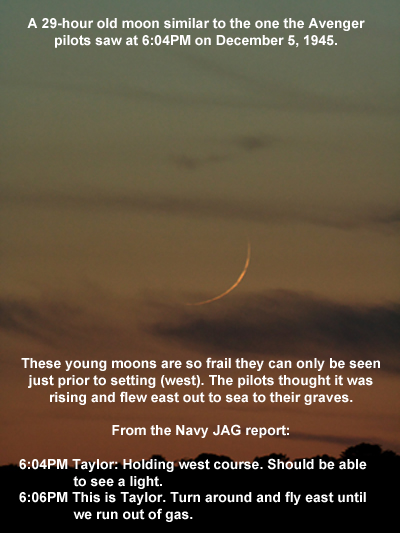 Captain Charles Taylor spoke of a strange light or lights (29 hour old moon). 2. The moon gave a very rare 180 degree illusion. 3. An experienced combat pilot beyond the point of no return turns completely around (180 degrees) and flies out to sea knowing they would have to ditch. 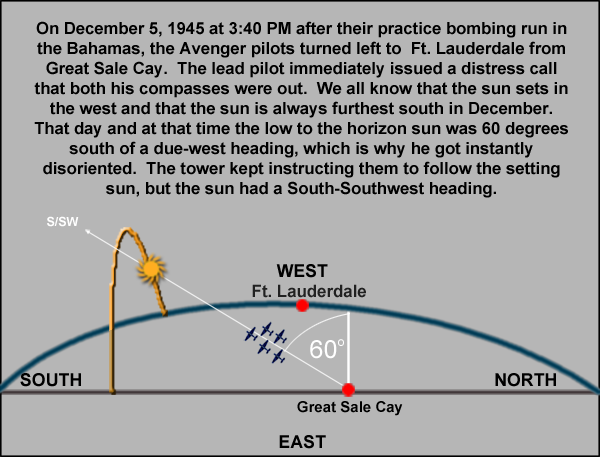 I first heard about the five missing Avenger planes in 1991 when I read article by Warren Richie in the Ft. Lauderdale Sun Sentinel. It told how similar planes were found off the coast of Florida and that the Navy was trying to determine if this was the infamous Lost Patrol. “Jeffrey Warren Hyman’s theory goes a long way in explaining a mystery that has been blamed on the legend of the Bermuda Triangle. We as astronomers don’t try to explain supernatural things. This isn’t magic. This isn’t make-believe. This is a reasonable explanation of what happened”. The press conference was covered by News Radio WINZ, The Miami Herald, The Tropical Tribune, The Palm Beach Post, The Ft. Lauderdale Sun Sentinel and WSVN TV Channel 7 (Mark Ludner and Rick Sanchez). I also spoke at a symposium on the Bermuda Triangle by the Ft Lauderdale Historical Society and was a member of the Ft Lauderdale Naval Air Station Historical Association.